“The higher you fly, the harder you fall,” the legend of Icarus goes. Mark Joseph Tajo Solis, a graduate student from the University of the Philippines-Diliman, learned it the hard way. Just a few days ago, Solis won first place in the Embassy of Chile’s Calidad Humana photography contest. Aside from winning $1,000 in cash, he also won for himself a round-trip ticket to Chile. The board of the judges includes the who’s who of academia and business: Tourism Secretary Ramon Jimenez, Oscar Lopez from the Lopez Group of Companies, the institution heads of UP, ADMU, DLSU, UA&P, and UST, among others. Chilean ambassador to the Philippines Roberto Mayorga even wrote an op-ed about it. See this link to see PhilStar.com’s news story about the event. However, Solis’ stay on Cloud Nine proved to be short-lived. Everything began to unravel for him early Sunday morning when Gregory John Smith, a Brazil-based social entrepreneur and founder of Children at Risk Foundation, posted on his Facebook page that he actually owns Solis’ prize-winning photograph. “There is really no limit to people’s abuse of others in this world. This is one of my photographs that just won first prize in a contest that I never entered,” Smith said. He also posted a link to his Flickr account where he originally uploaded the image in 2006. 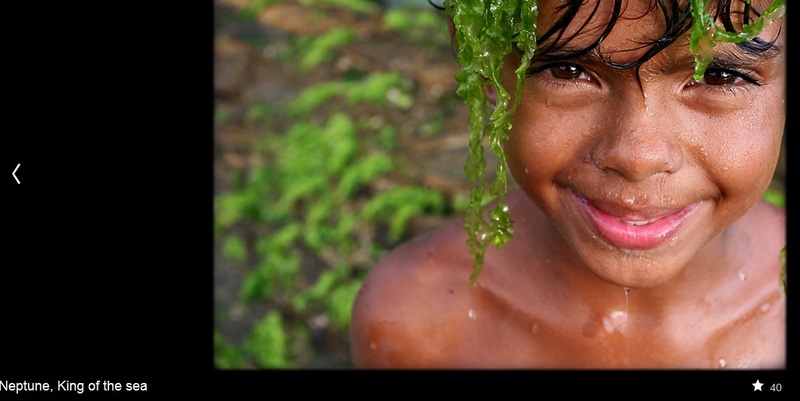 With the caption “Neptune, King of the Sea,” the photo shows a young boy drenched all over and with seaweeds on his head. In submitting the picture to the competition, Solis claimed that the picture shows a young boy from Zamboanga City whose house was ravaged by Typhoon Lawin back in 2012. To add insult to the injury, Solis entered the same image in a competition by the International Centre for Integrated Mountain Development. For that contest, he claimed that the photo was taken in Ramanathapuram, India. Following the revelation, Solis deactivated his Twitter and LinkedIn accounts. Nevertheless, the damage has been done, and as it turns out, there were two other instances where Solis won recognition for submitting photos he stole from the Internet. In 2011, Solis won the SAY PEACE Photo Contest organized by the Office of the Presidential Adviser on the Peace Process (OPAPP) for his purported picture of a young boy from Koronadal, South Cotabato. However, some Facebook users discovered that the boy in the picture is actually a Nepali and that it was shot by Alexandre Sattler, a photographer from France who uploaded the said picture in his Flickr page way back 2006. See Sattler’s original image in this link and compare it to Solis’ enhanced version here. Last July, Solis won second place in the photo competition organized by the Philippine-based Southeast Asian Ministers of Education Organization (SEAMEO) and the Regional Center for Educational Innovation and Technology (INNOTECH) for the culture category. He submitted a photo taken from the Ati-Atihan Festival in 2009, for which he got $300. See his ‘winning’ entry here. In reality, the picture was actually taken by travel blogger Renzelle Mae Abasolo. The picture is included in a slideshow she uploaded in her website in August 2011. Check out her post here. At the very least, Solis should be stripped of all the accolades he dubiously earned. Contest organizers ought to make sure that happens. Now, can he be expelled from UP DIliman for his actions? The 2012 Code of Student Conduct (CSC) penalizes plagiarism and other actions analogous to intellectual dishonesty by suspension for one semester or expulsion (read the draft CSC here). However, as pointed out by UP alumnus and lawyer Victor Bernabe, Solis might be able to escape that through a technicality since he did not use the photos for an academic requirement. Nevertheless, Solis now faces the challenge of living the years ahead in shame a la disgraced journalist Stephen Glass. But how does that explain the fact that he committed the same crime thrice? Is he that morally bankrupt? Sorry, but I cannot buy his apology. Degrading gays and women through "Nagmahal Ng Bakla"